Anyway, this was brilliant! It really gave me the goosebumps. The cast is made up of a professional team who played the main characters and then 80 members from the community, who formed the chorus. 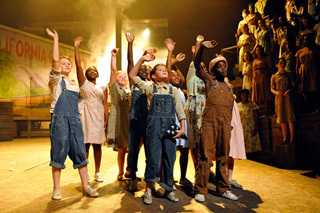 It really moved me… especially moments where the entire cast would sing. The music is well-written (Galt MacDermot who also wrote for Hair) and I loved the repeating themes (i.e. ‘Where are you going mister?’ and the opening theme). I particularly enjoyed it when they sang ‘Beautiful Music’, with Brenda Edwards (yup, X-Factor!) led it. It really was so beautiful and so powerful. One thing that I don’t experience often is when a show is done in libretto (sung entirely). It actually didn’t take any getting used to.. they were so good it seemed so natural. And delightful was that the lyrics were enunciated very well. Sometimes, I really struggle with understanding what people are singing, but not at all tonight. I loved bits of the set. Where a billboard became a trench and how crates were then used to represent coffins. I loved how the community was always on stage, looking over what was happening – just like in the Greek times (this is inspired by Homer’s Odyssey, hence the main characters being called Homer and Ulysses). I loved how proud the community cast looked to be on stage. I also loved how the main characters had multi-talents… musical talents were written into their characters and when they weren’t on stage being their characters, they would join the orchestra. So much talent in the world! Perhaps one thing that could’ve improved was the quality of sound from where I was sitting (gallery seats). The singing became echo-y. But otherwise, great!